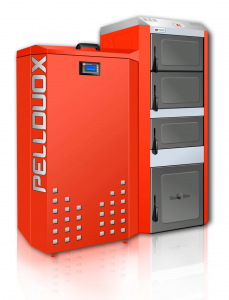 Solid fuel boilers | Atmosfera™. Альтернативные источники энергии. Солнце. Ветер. Вода. Земля. Solid fuel boilers Vita-Climate (Ukraine) are designed to heat the private houses, household and production facilities with wood, wooden and pressed peat, pellets. The design of the boiler provides with extremely long combustion of woods – the boiler at one load can efficiently operate during 7-34 hours. The duration of boiler operation is achieved thanks to vertical load of fuel with upper combustion and upper air supply. Hereby, the air, supplied to the furnace for combustion, is preliminarily heated by effluent combustion products that provides with additional increase in operational efficiency of the boiler. The air, supplied to the furnace, is directly sent to the combustion source that stimulates the combustion of the upper layer of woods with thickness of 15-20 cm. After combustion of one layer of fuel the air distributor descends lower and is always kept at the level of wood fire – in the combustion source. This does not allow igniting the whole volume of woods at the same time and provides with the even and controlled discharge of heat energy. 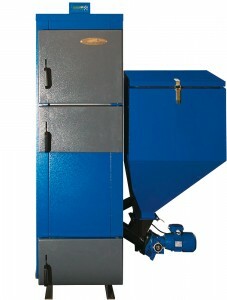 The universal automated pellet boilers Biokaitra (Lithuania) operate at any kinds of granulated solid fuel, including pellets from straw and sunflower husk. The boilers maintain both manual and automatic ignition. The automatics of boiler regulates the boiler rating depending on need of heating system either using external heat sensor depending on temperature in the premise, being heated. Boilers Biokaitra maintain the operation of 3 heating circuits: radiator hot-water heating, “warm floor”, hot water supply circuit. 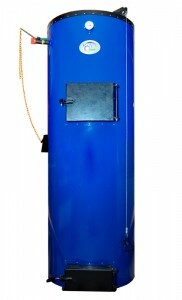 The capacious fuel storage bin allows the boiler autonomously operating at one load of fuel during up to 5 days. The coefficient of efficiency for boiler Biokaitra at operation with nominal capacity is 86-88%. Solid fuel boilers Kolton (Poland) are designed for efficient combustion of woods, wood wastes (hog fuel, cuttings, and chips), coal of different fractions, as well as pellets. The range of boilers Kolton includes both classical solid fuel boilers with manual load of fuel and boilers with automatic feed of bulk combustible materials, such as pellets or pea coal (Eco-coal). Boilers Kolton are made of attested steel with thickness of 6, 8 or 10 mm depending on capacity and type of fuel, being combusted.